Why are my Stripe payments failing? Are your clients trying to pay via credit card but they can't complete the payment? Payments via credit card are becoming more popular due to its convenience, but sometimes you may encounter issues with your clients processing the payments. Using the wrong Stripe keys. Stripe has two keys available in the API, the live and test keys. In order for the Studio Ninja and Stripe integration to work properly, you need to use the live keys and not the test keys in Stripe. You can check this by going to Account Settings > Developer > API. Make sure that Live is selected and copy over your Publishable and Secret keys to Studio Ninja. Take note that the Live keys are only available once you've activated your Stripe account. Confirm with your client that there is sufficient funds in their account to complete the payment. They may need to confirm this with their issuing bank. There is also a chance that they're entering their card numbers incorrectly, so have your client double-check their credit card numbers. Certain banks may turn off online payments for credit cards as a security feature. This may be because your client asked them to enable this, or there was a fraudulent transaction and the bank turned off online payments as a preventive measure. Have your client contact their bank to confirm. 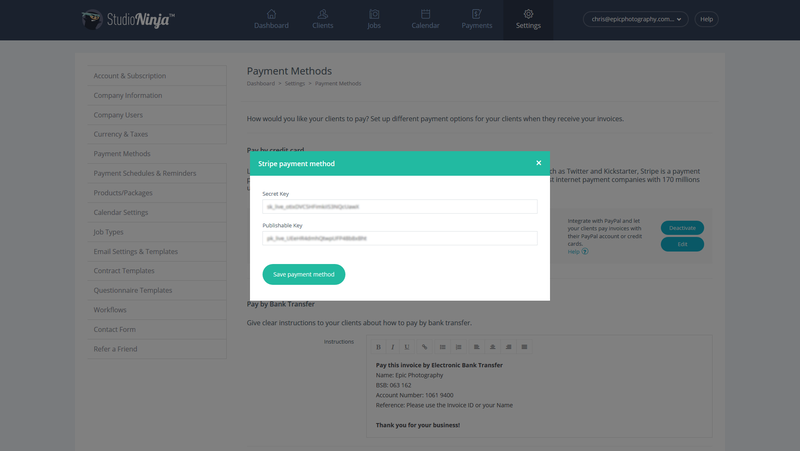 If your client is still reporting issues with paying via Stripe, you can reach out to us and we'll check what could be causing the problem.